Yellowstone national park is a natural wonder. Anyone that visits will tell you that there are few places on Earth that look quite as stunning as Yellowstone (personally, I think Yosemite is nicer, fight me), but this beautiful park is hiding a dark secret that could decide the fate of the human race. Yellowstone is what’s known as a supervolcano. The Earth has several of these beasts. One in Indonesia caused the Earth to be plunged into a volcanic winter near humanity’s infancy. Yellowstone has erupted three times in 2.1 million years. Scientists believe that the eruptions appear to happen in a cycle. Now, a lot of this sounds like your typical over sensationalized documentary on the subject, but I’m not here to scare you–not yet anyway. 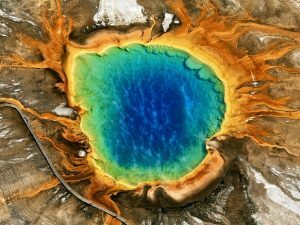 There are many scientific theories about how severe a super eruption from Yellowstone Caldera would be, and what the implications would be for the US, and the rest of the world. Some say that Yellowstone might never erupt on the scale of past super eruptions, others say that there isn’t enough data for us to be sure. The park experiences thousands of earthquakes every year, but in recent years there have been a range of alarming phenomena that have some researchers panicked, even while others claim of Yellowstone’s power are highly exaggerated. Heat levels are rising and the surface has risen. Some scientists think that another eruption at Yellowstone would be comparable to the one in Mount Saint Helens in Washington which happened in the 80’s. 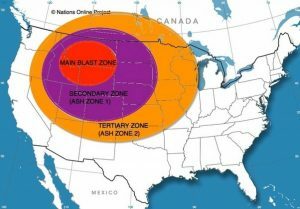 However, if Yellowstone were to erupt at the scale of its three prior super eruptions, then not only would it devastate an area the size of a continent, but the falling ash would be especially hazardous to our way of life. There’s a lot of speculation on that front, but, just know that it would be dangerous. 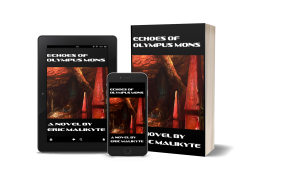 Echoes of Olympus Mons is coming out in just 10 days! You can get the Kindle edition for 25% off by pre-ordering now!